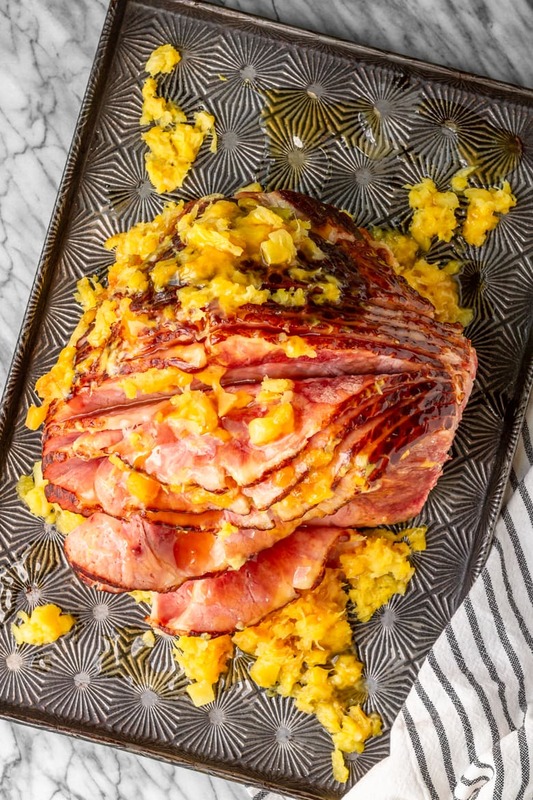 You simply can’t go wrong with this easy pressure cooker Instant Pot ham recipe… All you need is a bone-in spiral ham + crushed pineapple & brown sugar to make the easiest, most delicious holiday ham (or anytime ham) ever! This recipe was created in partnership with the Ohio Pork Council. Thanks for supporting us and the brands we love! Ham is kind of a big deal around here… As in you’ll almost always find it on the menu for any holiday dinner. We’re talking Easter, Christmas, even Thanksgiving (along with a deep fried turkey, of course)! Why? Well, ham pretty much universally liked — at least in our home. Plus spiral hams are naturally sized to feed a crowd. And they’re so EASY to make! Especially when you make them in the Instant Pot. What, you’ve never had an Instant Pot ham? Well, let me tell you, you’re TOTALLY missing out. Thanks to the closed cooking environment, ham in the Instant Pot is the most tender, juicy, and flavorful ham you will ever eat! No more over-baked dry and tough ham… Just perfectly cooked, sweet and succulent ham in a fraction of the time it takes to bake it in the oven. How Long To Cook Ham In Instant Pot? Because the very best thing about pressure cooking ham in the Instant Pot is that it takes less than 30 minutes! Seriously, no joke — AND that includes the time to come to pressure with a quick resting period at the end. To be a little more specific, I’ve found the perfect time to cook ham in the Instant Pot to be 1.5 minutes per pound, with an additional 5 minute resting period at the end. So you can estimate about 10 minutes for the Instant Pot to come to pressure, 9 minutes of cook time for a 6-lb. bone-in ham, and 5 minutes of resting at the end. 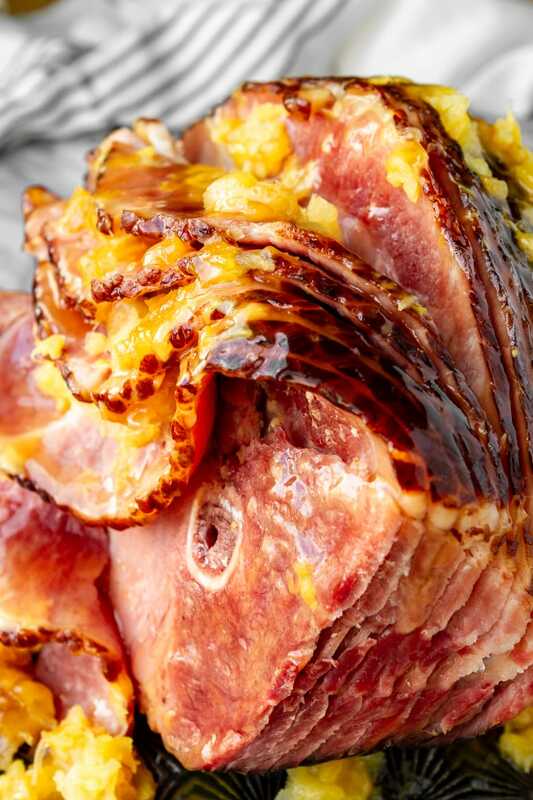 Right now you might be wondering if you can make ANY type of ham in an Instant Pot, and the answer is, yes, you absolutely can. 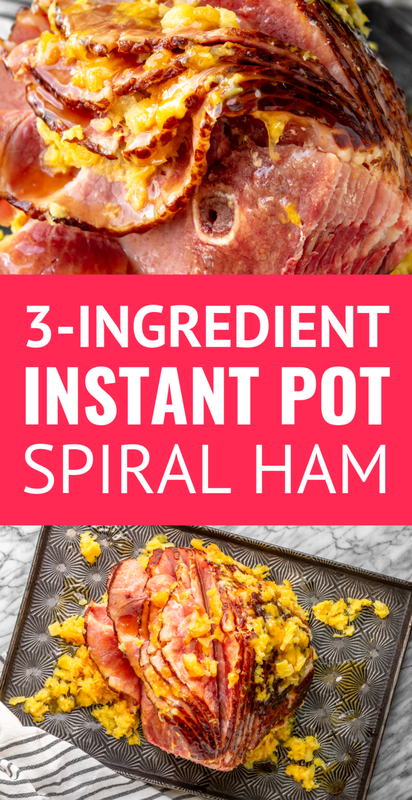 But I wrote this particular Instant Pot ham recipe with a bone-in spiral ham in mind. How large of a ham you can select is limited by the size of your Instant Pot. If you have the 6-qt. size, I recommend not going larger than about 6.5 pounds. For an 8-qt. Instant Pot, you can size up slightly to a 7-8 pound spiral ham. For reference, the ham pictured is a 7.5-lb. Kirkland spiral sliced half ham from Costco, which I pressure cooked in my 6-qt. Instant Pot. It definitely tested the limits of my pot (even after cutting some off), so dig, dig, dig through that pile of hams to find one that’s a little smaller. Or consider picking up the 8-qt. model to pressure cook a larger ham — I own and highly recommend both sizes! Cooking a bone-in ham in the Instant Pot is really not much different that making, say, my Instant Pot salsa chicken. 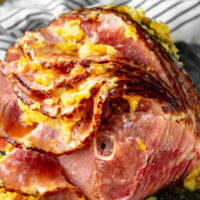 Overall, the ham in Instant Pot technique is very similar: you cook the ham on a trivet, remove it after a short Natural Pressure Release (NPR), and then sauté the remaining liquid from the pineapple, brown sugar, and ham drippings to make a delicious glaze. A key difference is that you’ll use a couple of pieces of heavy duty aluminum foil to form a sort of bowl around the ham. A cup of water goes in the bottom of the Instant Pot insert, along with the trivet, and then the loosely wrapped spiral ham is set on top. Pour a 16-oz. can of crushed pineapple over top of the ham, tucking some pineapple in between the spiral slices, and then sprinkle 1/4 cup of brown sugar over the top. Pressure cook the ham according to the notes in the recipe, and then allow the ham to sit for about 5 minutes before releasing any remaining pressure. Remove the ham, allowing any juices and drippings in the aluminum foil “bowl” to drain back into the pot. If you want to make the pineapple brown sugar glaze at this point (and trust me, you totally will — it’s AMAZING!!! ), turn the Instant Pot on to Sauté and add 1 tablespoon of cornstarch that’s mixed into 2 tablespoons of water to the water/juice/drippings mixture. Whisk until it thickens sufficiently, and then pour it over your cooked ham or serve alongside for guests to drizzle at will. Forget the over-priced Honey-Baked Ham, this EASY Instant Pot ham is sure to be the star of your holiday table! But it’s also simple enough to enjoy for a Sunday dinner any time. In fact, I strongly suspect that you may never ever BAKE a ham again! PIN IT NOW! CLICK HERE TO ADD THIS INSTANT POT HAM RECIPE TO YOUR INSTANT POT RECIPES BOARD ON PINTEREST! 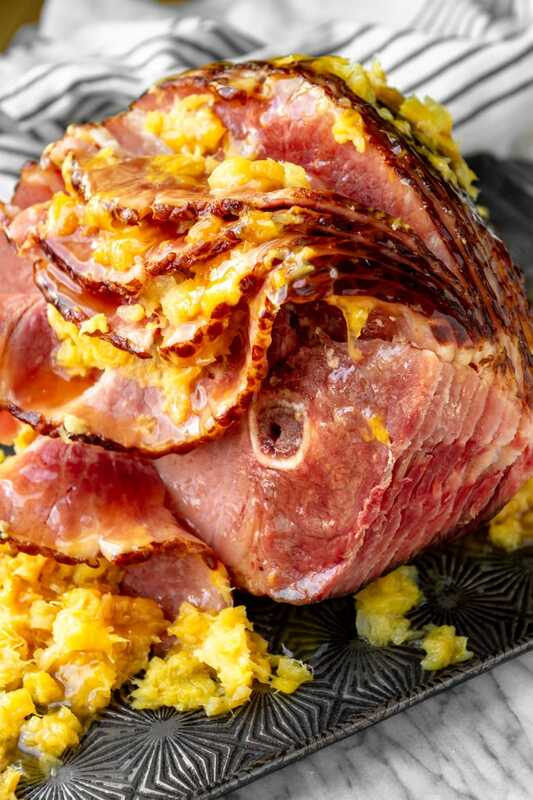 You simply can't go wrong with this simple pressure cooker Instant Pot ham recipe... All you need is a bone-in spiral ham + crushed pineapple & brown sugar to make the easiest, most delicious holiday ham (or anytime ham) ever! Place the stainless steel insert pot into the Instant Pot base, along with a steamer insert. Pour in 1 cup of water. Lay 2 lengths of heavy duty aluminum foil large enough to wrap most of the ham crossways on the countertop. Set the ham on its side in the center and fold the foil up around it, creating a "bowl" with the top open. 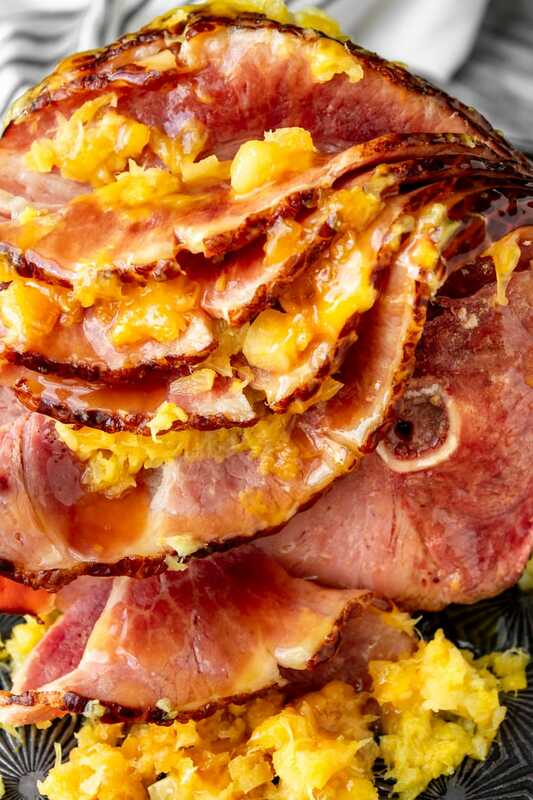 Place the wrapped ham in the Instant Pot and pour the crushed pineapple over it, tucking some of the pineapple between the ham slices. Sprinkle the brown sugar over the top. Lock the lid on top of the Instant Pot and make sure the steam release knob is turned to “sealing”. Use the plus or minus buttons to set the cook time to 1.5 minutes per pound of ham (example: 9 minutes for a 6-lb. ham). Wait a few seconds and you should hear a beep. At this point, the display will read “on”, indicating that the Instant Pot is pressuring up. Once it comes to pressure (about 9-10 minutes), it will switch to the timer to pressure cook the ham for the set time. When the timer goes off, allow the pressure to release naturally (NPR) for 5 minutes. Then use a thick towel or a pair of tongs to turn the steam release knob to “venting” to release any remaining pressure. If you’ve never experienced this before, it can be pretty forceful, so pull your hands away quickly, stand back, and allow the steam to escape. Once the pressure is released, remove the lid and transfer the cooked ham to a platter, allowing the juices in the foil bowl to drain back into the Instant Pot insert in the process. A pair of these silicone gloves are ideal for removing it easily. To make the pineapple brown sugar glaze (optional): press the Sauté button and then the Adjust button to select "high". Whisk together the cornstarch and 2 tablespoons of water, and then pour it into the water/juice/drippings mixture. Whisk until the glaze thickens, and then pour it over the ham or serve alongside it to drizzle at will. Press the Keep Warm/Cancel button to turn the Instant Pot off. 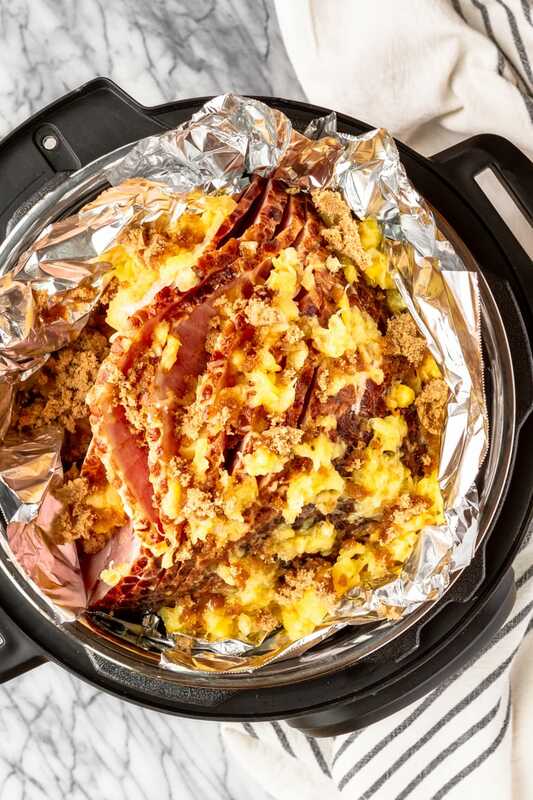 Wondering what to serve alongside this Instant Pot ham recipe? Here are a few of our very favorite tried and true side dish recipes! Make Ahead Mashed Potatoes — You simply can’t go wrong with this delicious make ahead mashed potatoes recipe… Filled with sour cream and cream cheese, it makes the BEST mashed potatoes. Always fluffy and delicious! Cream Corn Casserole — This custardy cream corn casserole recipe is SO good you’ll want to scrape the dish clean to get every last bit of caramelized goodness… My favorite of all the corn casserole recipes I’ve tried, just like my grandma made it! Easy Green Bean Casserole — This easy green bean casserole recipe is my family’s version of the classic recipe and uses only 3 ingredients, including canned green beans… Because who needs another complicated Thanksgiving recipe? NOT this mama! Cranberry Salad — To be honest, this cranberry salad recipe, with its sweet & tangy cream cheese topping, is probably more of a dessert, but we serve it as a side dish at all of our holiday dinners… SO good, a MUST TRY recipe! I’d love to see how your Instant Pot ham turns out… Tag me @Unsophisticook on Instagram or use the hashtag #Unsophisticook so I can check it out. Enjoy! If you’re a love of all things pork, check out these other fabulous pork recipes courtesy of the Ohio Pork Council! This really is the best way to cook a ham! So tender and sweet! I love how easy this is to make!! Thanks for the tips! Ham in the instant pot is the best ever. I have to try your recipe asap. I love using my instant pot because it makes my life so much easier! This came out GREAT and everyone LOVED it! This ham is perfection! Love it! Perfect for Easter Sunday without the hassle! Could this recipe be any tastier? Could it be any easier? I think not!! Delicious & Easy are my favorite things! Mmmm I love cooking with pineapple! I love how savory and sweet it makes a dish! Pinning for Easter! This seems so much easier than standing in line at the Honey Baked Ham, lol. This was just the recipe I needed for Easter dinner! Thank you so much!! I’ll pretty much try anything if it means I can use my Instant Pot! This was super easy and so tasty!